UNWIND – Separate shaftless or shafted unwind stand • Dancing roller for tension control • Pneumatic brake or electric motor • Automatic webguiding system. 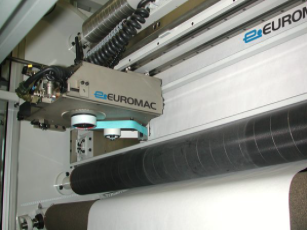 SLITTING – Slitting system at shear-cut rotary blades or with oscillating razorblades • Knifeholders on shaft or linear bearing guides • Specific web path for Wrap-cut or Tangent-cut • Manual, semi-automatic or full-automatic positioning of slitting blades • Driven spreader roller(s) for separation of slitted stripes. WEB PATH – Overhead web path or footboard • Aluminum idler rollers • Driven main pull roll with own pressure roller or “S” wrap. 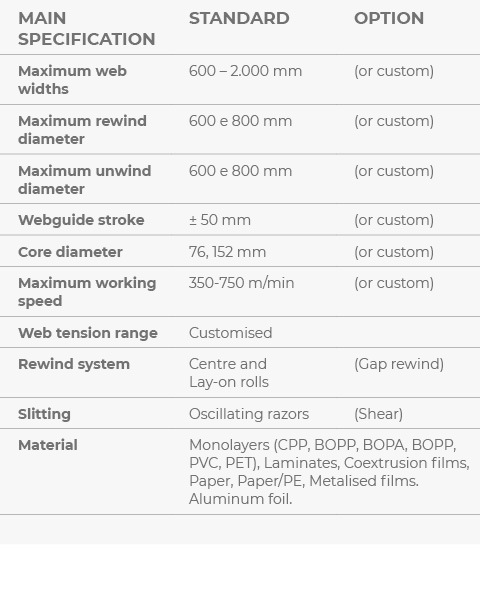 REWIND – Single Turreted centre wind, assisted by lay-on rolls • Automatic cycle for downtimes of aprox. 30 seconds • Transversal splice with automatic sequence • Air expanding rewind shafts and lay-on unit control • Roll offloading by manual or motorised trolley. AUTOMATION – PLC for all machine functions and controls • Touch screen digital operator panel • Modem for remote monitoring. 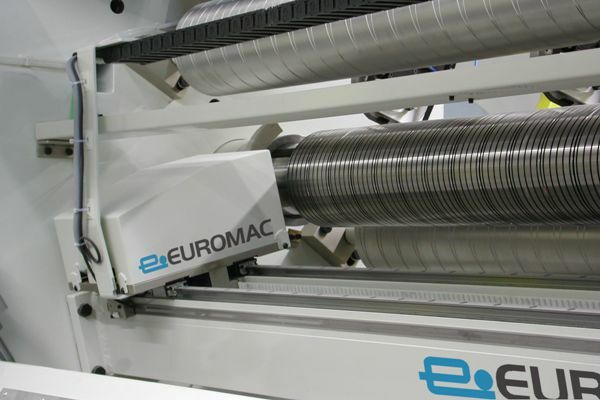 Automatic blade and counterblade positioning device by computer control featuring two moving positioners mounted on linear guides for a slitting position precision tolerance of +/- 0.2 mm. Aproximate position time is 10 seconds for each knife/counterknife. Rangefinder for digital positioning of the slitting blades/counterblades by means of two setting rods mounted on linear guides and digital display for positioning tolerance of +/- 0.1 mm. 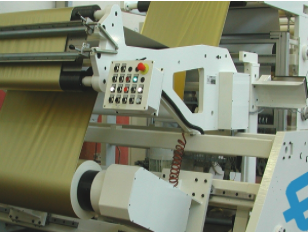 Automatic taping device to close the finished reels and pre-tape the new cores. 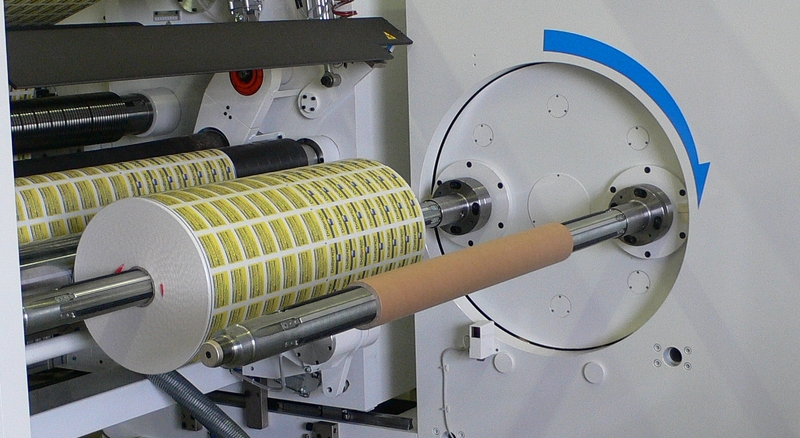 Two double sided adhesive tapes are applied on to the web before slitting in full automatic cycle. Splicing table fitted overhanging the unwinder. 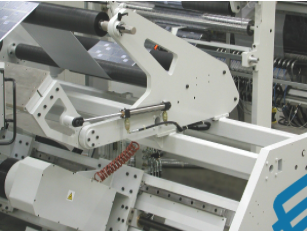 Ortogonal slitting slot and web locking bars by mechanic or pneumatic operation. Mobile splicing table fitted overhanging the unwinder. 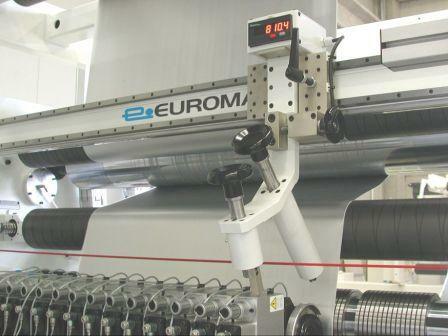 Ortogonal slitting slot and web locking bars by mechanic or pneumatic operation. Possibility to recall splicing table in working position upon push-button command.